When a rose is not a rose, it’s soothing, beneficial and beautiful geranium. Native to southern Africa where they have been used in traditional medicine for centuries, geraniums were beloved by the Victorians, and can now be found blooming in gardens across Europe and North America. Geranium essential oil, which is steam-extracted from the whole plant, is found in skincare products, fragrances and traditional remedies. It is known for its lovely, rose-like fragrance, as well as its beneficial effect on skin and the emotions. One of the most popular bedding plants, geraniums are small flowering shrubs that can grow from 6 inches to 3 feet high, and can be up to 2 feet wide. Geranium flowers come in a wide variety of shades, and often bloom in big, showy clusters. Most geraniums have a floral, rose-like aroma that varies in intensity based on the variety. Because of the lovely rose smell, geraniums were frequently included in flower arrangements by the Victorians. Even though many geranium varieties smell like roses, there are varieties that bring to mind other scents, including lemon, nutmeg and cinnamon. Geraniums are native to temperate and tropical areas of the world, and many varieties originated in southern Africa. They are an extremely popular garden plant, and can be found as perennials (living for several years) gardens in temperate regions all over the world. In areas that freeze over the winter, they are grown as annuals (surviving for one growing season only). They can be grown indoors virtually anywhere. Geranium essential oil is thought to help balance the heart chakra. It decreases kapha and enhances or balances pitta and vata. Geranium essential oil is considered a pitta oil, which can cool and calm the mind and body, whether from physical inflammation and overheating, or mental and spiritual distress and over-stimulation. In Traditional Chinese Medicine, geranium is thought to have an affinity for wood and earth, with a focus on the liver, heart, and spleen meridians. Geraniums are also known as pelargoniums (storkbills), after the Greek word for stork, “pelargós”, because the seed-head of geraniums look like a stork beak. While many of the Victorian symbolism various varieties of geraniums have been forgotten, it is still a very popular houseplant, and giving a geranium as a housewarming gifts signals good wishes and friendship. The word “geranium” can actually refer to two kinds of plants – the bright and showy summer flowers commonly known as geraniums, but which actually come from the genus Pelargonium (meaning stork), and the “geranium” family of over 400 flowering plants, also known as cranebills. If you have geraniums in your garden, they are likely to be pelargoniums, and the pelargonium family is also where geranium (pelargonium) essential oil comes from. Clear as mud? The confusion arises because the two plant families look very similar, and were classified as one until the late 1700s. Geraniums are native to South Africa. The first pelargoniums cultivated by Europeans were likely brought to the Dutch town of Leiden before 1600 by ships travelling through the Cape of Good Hope. Pelargoniums were imported to England in the 1630s, and by the 1700s, many varieties were being cultivated by European gardeners. Geraniums became especially popular in England, and by the Victorian era, hundreds of varieties of geraniums with many colours and beautiful scents were cultivated in gardens everywhere. Scented geraniums could mimic many popular scents. Scented geranium varieties included rose, lemon, lime, orange, filbert, nutmeg. almond, apple, anise, pine, musk, violet, lavender, balm, oak and peppermint. In the US, Thomas Jefferson recorded growing geraniums at the President’s House while he served as president from 1801 to 1809. When he retired, he gave a geranium to a famous Washington socialite, Margaret Bayard Smith. In the 200 years since, geraniums have continued to be a popular North American bedding plant. Today, geraniums are found in gardens in temperate regions around the world, and geranium essential oil is an important ingredient in fragrance and skincare. 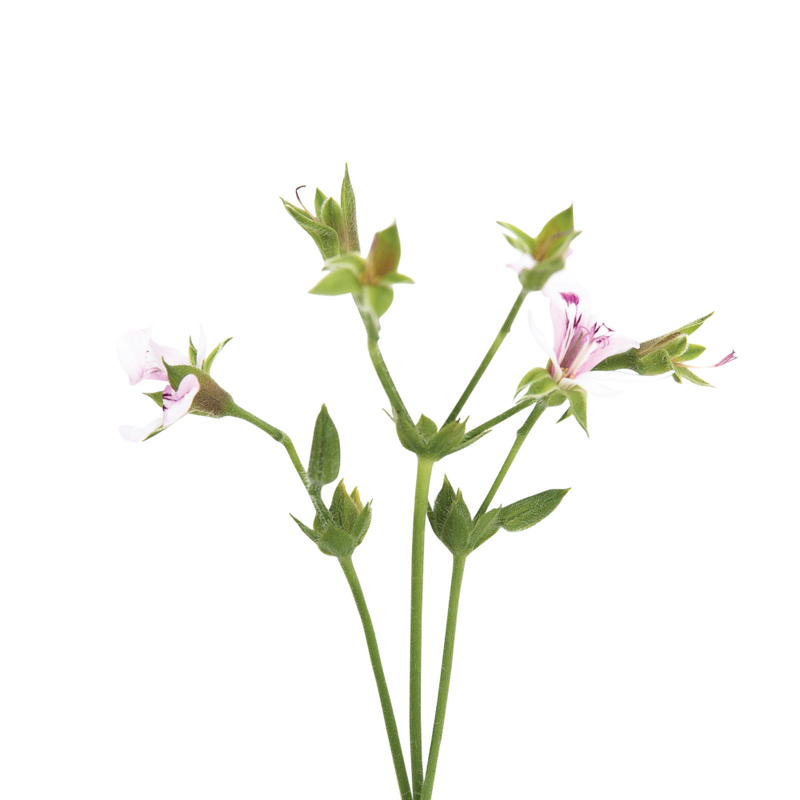 Geranium essential oil is valued for its beautiful, rose-like aroma, and its ability to promote healthy skin. Geraniums are a popular flower – so popular that they appear in the pages of many beloved classics. In Louisa May Alcott’s Little Women, Amy keeps a pet red geranium plant, and its flowers are used to decorate the blancmange (a simple cornstarch pudding) that the girls bring to their dreamy neighbour, Laurie, when he gets sick with a bad cold. In Harper Lee’s classic To Kill a Mockingbird, Mayella Ewell keeps red geraniums in jars outside her house – a symbol of her aspirations for a better life. In E. M. Forster’s A Room With A View, geraniums fill the garden of local cottages.